Where did all the footprints go? My son left his backpack at church Thursday night, so Friday morning (yesterday!) my husband went to church/work early, brought the backpack home and picked up my son and delivered him to his campus. But then at the last minute, I decided to hike for 30 minutes before work. At 2:30 PM I finished working and drove back to the trails to walk another 45 minutes. 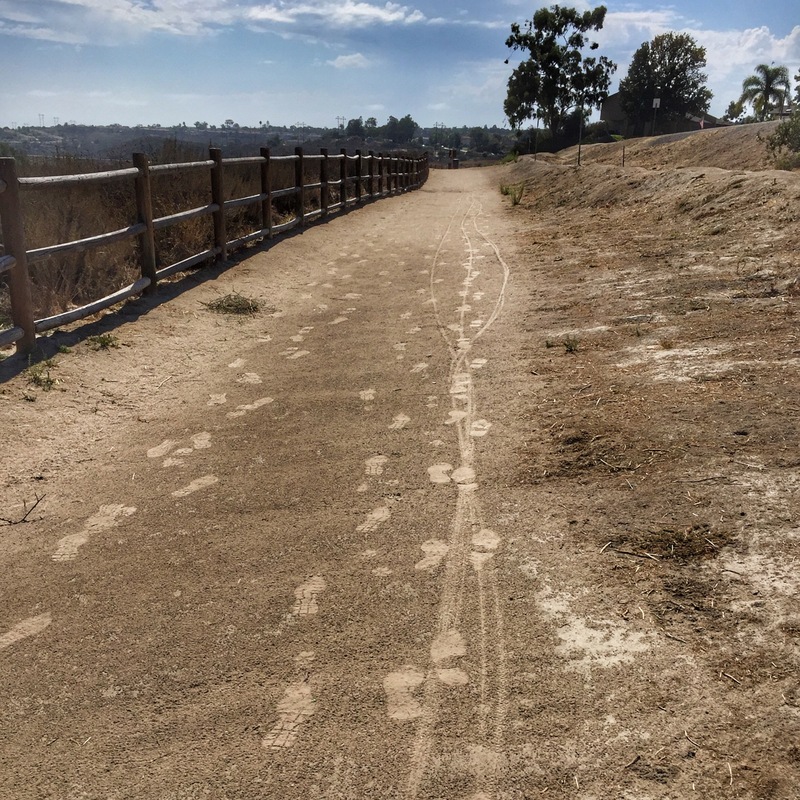 That’s when I saw the footprints and mountain bike tread patterns had been erased by rainfall. Only a couple sets of prints remained. The thing is, I was at home from 10:30 AM to 2:30 PM. The trail is just three minutes from my house. I never heard or saw any rainfall. Did a cloudburst occur only over the trail system? This is a mystery. My sleep lately has been terrible. I’ve been averaging 7 hours of sleep a night, but that includes couple of hour-long naps. Twice I’ve slept only six hours a night this past week. So I was looking forward to catching up on sleep this morning. For that reason, a text message jangled me awake at 7:52 AM. That message was followed up by at least three more messages before 8:30 AM. I blame old age and those bright-eyed early Saturday morning people who don’t work until midnight on Fridays. Tell me about sleep. Some of us battle with it most of our lives. I must take a light sleeping pill or I’d be getting up after about an hours sleep. I know this because I forget my pill every now and then, and that is the result. I wonder why I’m so restless, and then I think, “Did I forget my pill?” I check, and I have. Anyway, I get anywhere from 5 to 7 hours most night, usually about 6.5. And I nap on most days, but only for about 10 minutes. I time myself; I look at the clock when I know that I’m close to dozing off after resting for a bit, and I look at the clock when I awake. Ten minutes is about it although it can extend to 20 on some days.